Zoos are just a little bit sad, aren’t they? Even the most state of the art, animal-welfare friendly zoos that claim to faithfully re-create the animal’s natural habitats will always fall short of the real thing. There’s no place like home and no matter how hard they try, a zoo or an aquarium is no substitute for the wild. It’s a bit like a human living in a Travelodge instead of their own home, it might meet all the basic requirements you wouldn’t want to stay forever. In certain parts of the world, such as ‘beautiful British Columbia’, you don’t need to settle for the imperfect experience of visiting a zoo. You can see some of nature’s most fascinating and endangered animals in the wild. Going whale-watching in a place like Vancouver is something that can be taken lightly, a decision you can make on a whim. There are at least three or four companies making daily excursions, all charging more or less the same reasonable price. It’s this easy accessibility that makes whale-watching seem to a first-timer like just another tourist activity, something different to do on your holidays and for this reason, whale-watching is invariably more thrilling, more special and more moving than you can ever anticipate. The package offered by all of the companies operating in and around Vancouver is more or less the same. You can be picked up from your hotel or make your own way to whichever dock your boat leaves from. 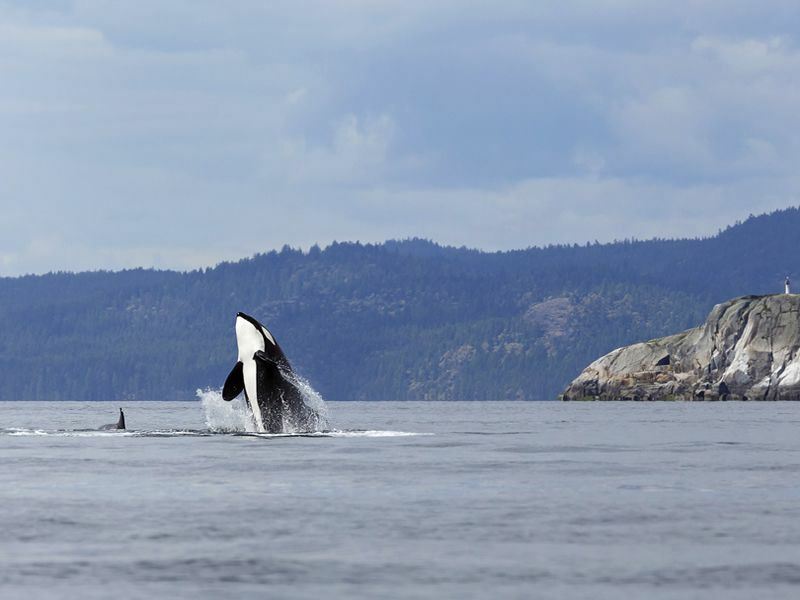 After being fitted with a life jacket, your captain will drive you out to the Gulf and San Juan islands, an area known to be one of the best whale-watching spots in the world. Depending on which package you’ve gone for you’ve now got either a half day or a whole day to get spotting those orcas. As I’m sure you know whales are not domesticated animals. They’re not going to hear the boat coming and all rush up to the surface so you can pet their leathery heads, so you will have to spend some time searching them out. To be honest, even a day spent speeding around the North Pacific looking for whales is thrilling in itself. The scenery is other-worldly, especially if you’re a stranger to the area and boating novice. You’re almost guaranteed to see sea lions and seals and if you look up you might even see some eagles. But, let’s face it, you’re there to see some whales. I don’t exactly have sea legs and it can be a little cold and uncomfortable on the boat after a while. At least that’s what I was starting to feel after a few hours on the water, before we got our first glimpse of what we had came to see. But once I did see them – these enormous, achingly beautiful animals just going about their business in the vast, freezing sea – I would have been happy to stay on the water for another few days just waiting to get another look. More information and to book: No trip to Canada would be complete without sightings of its spectacular wildlife. Our Canadian wildlife holidays give you the chance to see these fascinating creatures in their natural habitat, including the awe-inspiring polar bears, orcas and and Pacific White-Sided dolphins. Article written by Toni Marie Ford.